The Rotary club of Medina Sunrise congratulates Bailey Freeland, winner of this year's 4-Way Test Speech Contest along with three other extremely talented Cloverleaf High School student contestants: Mariel Leatherman, Grace Schmitt, and Trystan Turpin. "This speech contest provides a challenging way for our students to develop critical thinking, ethical decision making, and public speaking skills," stated Mr. Joel Shurance, Chair of the Cloverleaf HS English Department. "Cloverleaf is very proud of all our contestants and we send our best wishes to Bailey, as she competes in the Rotary District speech competition." This Test has been translated into over 100 languages and is Rotary’s gold standard for ethics. All around the world, it has helped its members - build friendships and experience greater success at work and in life. 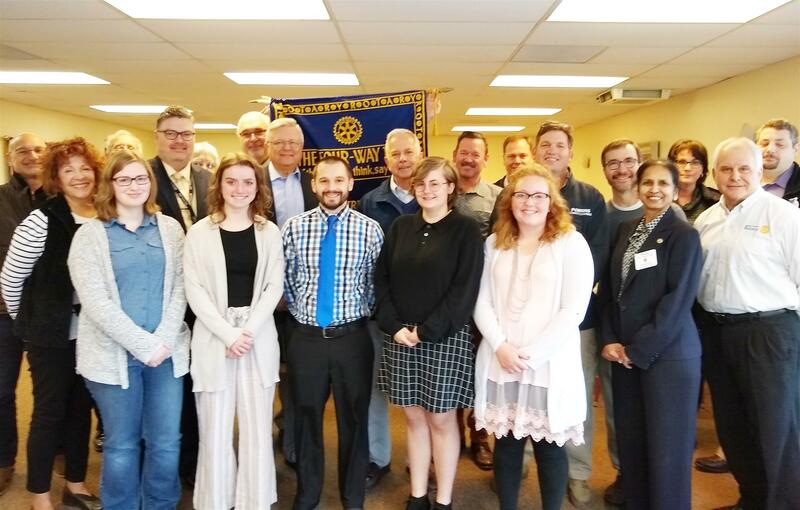 Over the years, Rotary Clubs in District 6630 have partnered with schools and offered this opportunity to their high school students. Feedback about this program from teachers, students and parents has been consistently positive and has strengthened ties to the local community. The purpose of the 5 to 7 minute speech is to apply the principles of Rotary International’s 4 Way Test to a current ethical issue. Students are challenged to identify a topic they feel passionate about and to adopt a point of view from which they will seek to persuade others. The contest takes place at School, Club and District levels. Three contestants per school compete at the Club Contest, and the top winner from each school advances to the District Contest. In addition to recognition, students can also win cash prizes at the Club and District levels of the contest. District level prizes range from $200 to $1200. The Contest Guide along with videos of previous winning speeches is available on www.rotarydistrict6630.org under the 4 Way Test Speech Contest tab.